We offer a totally unique villa offering 6 bedrooms and 4 baths sleep to 14 guests.We offer two furnished homes to appeal larger groups in privacy and comfort that are always rented together..Each spacious home is 3 bedrooms 2 full baths and overlooks the great pool with wide intracoastal views .5 Star Beachside Location,with priceless 200 feet of Waterfront on the Famous Intracoastal waterway where you will see a parade of super Yachts .. Both kitchens are fully equipted with all utensils,pots and pans. We also offer "Alexa" as an on site concierge to answer questions about dining and attractions 24/7.Great intracoastal covered patio for your group get togethers watching yachts go by. The property is a classic duplex with Original Florida Keys decor with collector furniture and colorful Haitian art..Our international Manager Julia is there to greet your group on arrival and is available to you along with our support staff during your entire visit.She will provide tips on local restaurants and activities.The property is three blocks east of Fort Lauderdale Beach.See is the mega yachts from your heated pool. The villa is located on the ocean side of the intracoastal just south of Oakland park Blvd..It is 2 blocks south of some of the city's best dining at Thousand Islands Greek Taverna,Cafe Materno and Famous Shooters Waterfront Cafe.One Mile north of the most elegant shopping at the Galleria Mall Featuring Neiman Marcus Cartier and Bally. You have access to the entire property. Only the storage closet on the property is off-limits. Julia P., will be greeting you upon arrival. She is available by phone or email.Please email any questions you have or we will call you back..
We are professional managers in the vacation rental market. Rent with Confidence in our upscale properties. 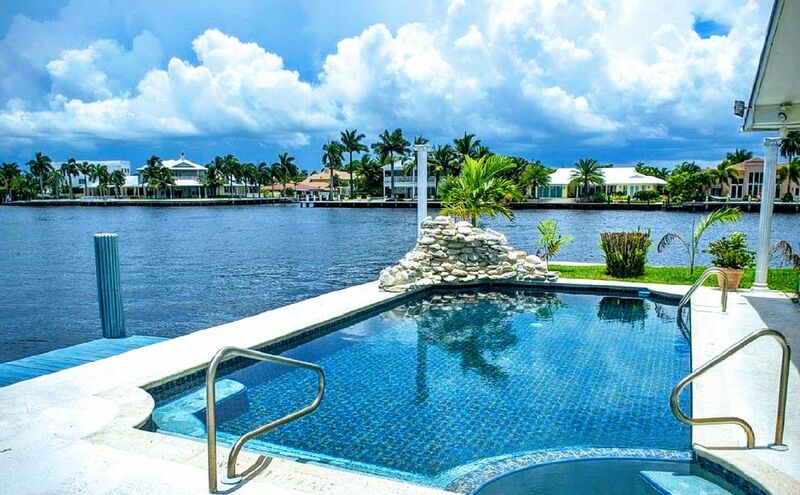 Views of the intracoastal. We comply WITH City and state to conduct a SAFE VACATION RENTAL. Best location in the city. Beachcombing, Marina, Snorkeling, Deep Sea Fishing, Golfing, Beaches, Wind Surfing, Surf Fishing, Groceries, Pier Fishing, Childrens' museums, Boomers amusement Park, Broward Center for the Performing Arts, Ice Skating Rink, Bowling, Pompano Racetrack with live harness horse racing, casino with Las Vegas-style slot machines, live poker & fantastic restaurants are all within 10-20 mins away. Palm Aire Golf Course is 10 mins away and if shopping is desired the Galleria Mall is 10 mins to the south and Town Center Mall in Boca Raton is about 20 mins to the north. Craving South Beach excitement? A water taxi is available a short distance away which cruises to South Beach! The view is so awesome! This place was great for 13 girls! .. so close to everything we wanted to do as well! The only thing that would make this house perfect is an update. Other than that we were pleased with our stay. Anything we needed the owner was super helpful! Thank you! We were here for a bachelor Party. About 5-10 miles from everything or a 15-30 minute Uber ride. Great accommodations for an event like this. Perfect place for about 10 people. Great for golf weekend or bachelor party. Julia was great, pool was clean and house was clean. Good place for the price. Julia: What a great time we had at your place. Convenient right on the Intercoastal with all the fancy boats going by. All we could ask for: clean, comfortable, and beautiful. Thanks again! See you next year! Roomy villa with a nice pool and great scenery! The party was 9 and served us well. Its not new, but the views on the inter-coastal are great and provided us a couple days worth great of boat watching from the big back porch and side pool area. All rooms are a nice size, plenty of bathrooms and 2 kitchens (one in each villa). Julia is great host and very attentive and quick to answer any questions. For a similar type of trip with a big party, I wouldn't hesitate to rent this property again. From the start, Julia was very accommodating with our large group of 13. Perfect spot along the water and location is quiet and ideal for bigger groups or multiple families. We appreciate the accessibility and ease of booking with Julia and she was happy to meet us if we needed anything. The house is spacious with many rooms, the pool was fantastic, as well as the sitting areas outside. If you need a great vacation spot and don't want to spend a fortune, this is your option! Great Location, can't beat this place!!! You are my favorite group !!!! *Its just a few steps away from a warm white sand beach to the east.Fort Lauderdale used to be known as the Spring Break Capital of the World. Now the city has transformed into a mega-tourist center. The owner does not require a security deposit rental insurance is mandatory..Broward County resort tax of 7 per cent is collected by Homeaway.Pets are permitted and a fee is applicable ..Check in is 4PM; checkout is 11AM unless permission is granted. Please e-mail manager for specific questions or further information. Must agree to comply with city of Ft Lauderdale Vacation Rental rules they are attached to the rental agreement . Only the number of guests listed on the application and rental agreement may sleep in the villa if extra guests are present in excess of our license the guest will be asked to leave . No trucks or commercial vehicles may be parked on the property without prior permission. Minimum age to rent is 23 no parties are permitted on the property.. A separate electronic Rental Agreement is required to book this property.. .